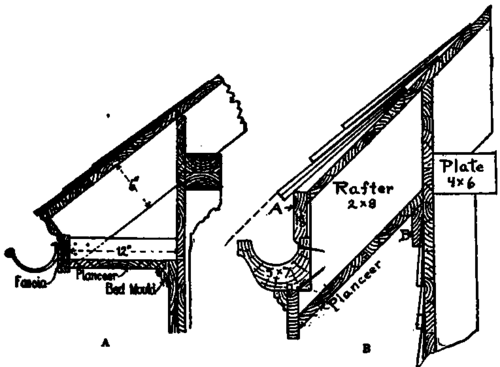 Sharon was excited earlier today when she discovered online an architecture book titled "Building Construction and Superintendence" that gave information about how gutters were done in 1906. It had several diagrams and showed how the gutters were installed. And as Sharon dug into the book further, she discovered all kinds of great stuff. It had information about soapstone, siding, interior woodwork—it was like—WOW! What a great resource! Too bad it was missing so many of the diagrams and figures. Now, imagine Sharon's surprise when she realized this book was written by F.E. Kidder. Frank E. Kidder—Jeff's Great-Grandfather! We actually have this book (or rather series of books) in our personal library! How lucky is that? It was packed and stowed away for safe-keeping during the remodel, but now that we know what a treasure it is—we went and pulled it out of storage. Sharon is now hoping to post short sections from these books, as they relate to our remodel.